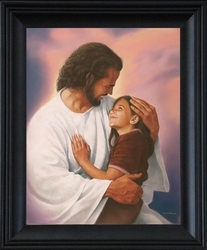 Adoration by David Bowman is a Christian art piece that is available framed or unframed. It is a Top Twenty seller at LordsArt.com and make a great gift or addition to any home décor. The expression between Jesus and the little girl (who happens to be one of the model’s daughters in real life) says it all in this piece---“I adore you.” The closer one draws towards the Savior, the more he or she adores everything about Him. Thus, I can only imagine the overflowing joy and love we will feel when we are actually in His presence, in His embrace. The feelings of adoration will be so intense and amazingly, I don’t think they will be one-sided. I picture Christ peering so deeply into our hearts, with His perfect love, that His adoration for us will be just as intense. 6 Options Available - See drop down box for pricing. Framed pieces feature… High-quality, giclee prints with textured coating (instead of glass) Real wood frames (made in the USA) Signed by the artist & ready to hang!